This tutorial covers the creation of a Default Main page and the various options of a right sidebar. 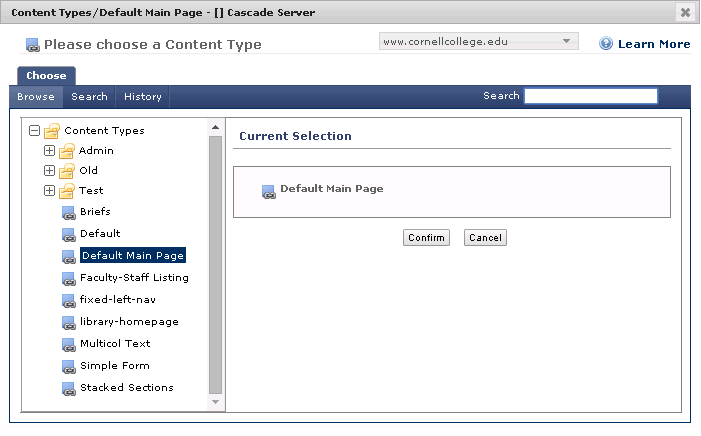 To create a Default Main page, create a standard page and go to the System tab. Select the Browse option next to Content Type and, in the page which appears, select Default Main Page. Once Default Main Page has been selected, you will be redirected to a slightly different screen than of a standard page. The biggest difference is that, under the header of Default Main Page, there are two checkboxes next to the phrase "Layout options." You may select one, both, or neither of the options. If you select "Banner," the finished page will have a wide image going across the top. Selecting "Right sidebar" will create a column on the far right of the page with multiple options unavailable on standard pages. Inserting a banner image works mostly the same as inserting a normal image within a page, although due to the unique formatting you should be certain that the image follows the size guidelines before inserting it. The right sidebar is the main function of a Default Main page which differs significantly from a standard page. When the Right sidebar box is checked, a new section will appear under the main body field of the page. 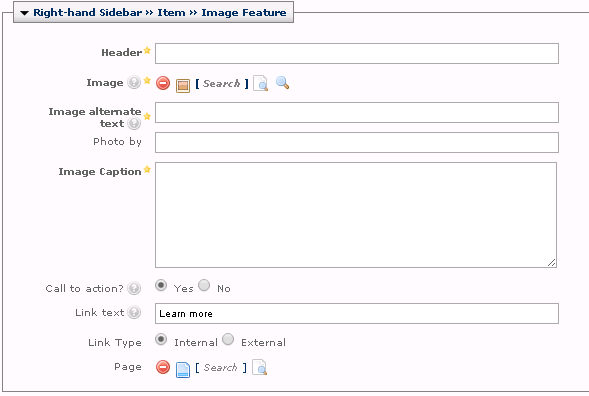 A right sidebar can have multiple items, and each item can be one of six features. A sidebar can consist of as many items as you want, or as few, but it must contain at least one item. There is no limit to which items are used, or how many of each there are. The default for an item is an image, which is the most basic option. Each image must have a header to appear above the image, alternate text in case the image fails to load for whatever reason, and a caption describing the image. There are also options to credit the photographer or artist of the image, as well as a choice to insert a link beneath the caption and edit the text of that link. The second option is to have a Twitter feed embedded in the sidebar. The default is the official Cornell College Twitter, but it can be changed to any account which you have access to. The Twitter User ID is the user ID of the account you wish to have a feed to, and the Widget ID is created under the Settings menu on the account. Unfortunately, there is currently no way to create a feed to a Twitter account which you do not have access to. The third option in the sidebar is a Facebook feed. All that the Facebook feed requires is the Facebook page ID, which is the string of numbers towards the end of the page's URL. 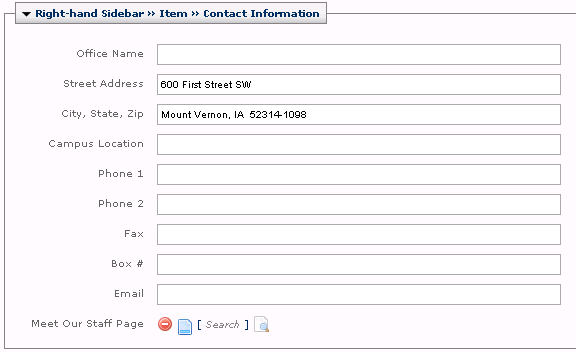 Option four is contact information, which is mostly self-explanatory. The link at the bottom is used for exclusively internal links to the official contact page of the group in question. The fifth and sixth features in the sidebar are a Calendar Events list and a News feed. Both are managed with blocks, and to use them you simply select the appropriate gray block and decide how many items you wish to appear. For a calendar, those will be the first few upcoming events, while for a news feed they will be the most recent items. A right sidebar column will only go as far down as its content reaches, so if the content of the main body of the page extends past the reach of the sidebar then all text and images below the bottom of the sidebar will format all the way to the right margin of the page.